Safety first: Tourists will be looking for operators that place customers’ comfort and safety above all else. They will be looking for vessels that are properly licensed to take out recreational passengers and equipped with the standard safety equipment like life-jackets and communication systems. They will place their trust in the skipper/captain to make sensible decisions about weather conditions and when it is time to cut a tour short for reasons of safety and comfort. Of course some ‘gung ho’ customers may put pressure on skippers to carry on until a whale is found, regardless of conditions. But skippers should bear in mind that a negative safety incident will have much greater, lasting and damaging consequences for the business’s reputation than the possible disappointment of a single customer. Customer satisfaction through management of expectations: Whale watching can become very competitive, and operators are challenged to attract customers through their harbour-side/shop-front information, leaflets and brochures that are left in hotel lobbies and visitor centers, and ever more importantly, through their online marketing materials. It may be tempting to promise whale sightings and use spectacular photos or videos of animals engaged in the most striking behaviours that customers are unlikely to observe first-hand. These may reel in a few first-time customers, but businesses that stand the test of time, and receive positive recommendations on social media, are those that create realistic expectations for their customers and live up to those expectations. Operators cannot control weather conditions or the distribution of whales from one day to the next, but they can control how they will interact with and care for customers, how much information will be provided to customers to make their tour interesting and educational (see below), and how they contribute to the local community and conservation of whales and dolphins and their environment. These are elements that can be emphasized in marketing materials, as well as the whales and dolphins themselves. Dolphin watchers on board a registered tourism vessel in Sarawak, Malaysia and equipped with life jackets. Photo courtesy of the Sarawak Dolphin Project. Create realistic expectations for passengers, and avoid using too many 'spectacular' images or videos in your marketing materials. Focus on the quality of guiding and service instead. Photo courtesy of Fabian Ritter/MEER. Use a commitment to responsible whale watching as a marketing point: Operators can set themselves apart by marketing their responsible approach to whale watching. Research shows that whale watching tourists do not want to contribute to pressure or over-crowding around whales or dolphins1 and that they value conservation of the populations they are watching2,3. It also shows that vessel captains can achieve goals for a ‘successful trip’ in the view of their passengers without rushing to join an already-watched (group of) whale(s)4. Operators who emphasise their commitment to sustainable and responsible practices will set themselves apart. In some parts of the world it is possible to achieve official certification as a responsible whale watching operator, through schemes like WhaleSense (East and West coasts of the USA) or the ACCOBAMS High Quality Whale Watching Label in the Mediterranean Sea. Hosting researchers on board, who can act as expert naturalist guides, or following a protocol to contribute sighting reports or photos to local whale research projects are also good ways to demonstrate commitment to conservation, and will make participating tourists feel that they have engaged in something special – akin to the research they watch on National Geographic or the Blue Planet Television series. Respect local guidelines or codes of conduct: Many operators understandably feel pressure to provide their passengers an ‘up close and personal’ encounter with whales or dolphins. In an effort to allow their passengers to obtain the perfect photo (no easy feat with fast-moving and unpredictable animals), they may be tempted to approach animals too closely, too quickly, or from the wrong angle – especially if other operators around them are doing the same. Research has shown that vessels that drive too fast in the presence of whales or dolphins present a greater risk of injury and disturbance5. Furthermore, research and experience shows that respecting approach guidelines – maintaining minimum distances and idling or shutting off engines to see what the animals will do – is more likely to result in a sustained and rewarding encounter with the target animals, which are more likely to feel at ease and behave naturally or curiously than if they feel threatened or chased. This has been the case in Loreto Bay Mexico, Port Phillip Bay, Australia6, and countless other places where operators have made the effort to slow down, back off, and let the animals determine the terms of engagement. Offer an enriching educational experience: Research has shown that including a structured educational element in whale watching tours can serve as a type of insurance to manage passengers’ expectations, and ensure that they have a pleasurable and enriching experience even if the stars of the expected show (the whales or dolphins) do not appear on cue and/or do not engage in any spectacular behaviours7. Tourists appreciate and look for good environmental education during their tours and miss it when it is not offered8. 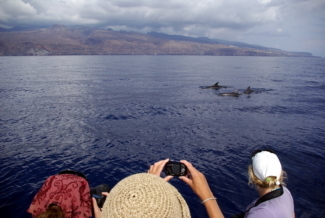 When an educational element is included in a whale watching tour, it has the potential to be the first and most important source of information about whales and dolphins9 for many tourists. When structured properly, and followed up with repeated whale watching experiences and post-tour communication, it can actually change tourists’ outlook and willingness to engage in conservation activities10-12. More detailed information on how to offer a high quality educational experience can be found in this section on On-board education. 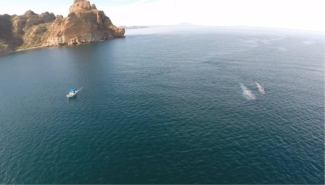 A whale watching boat engages in passive whale watching in Loreto Bay Mexico. Photo courtesy of Diane Gendron. 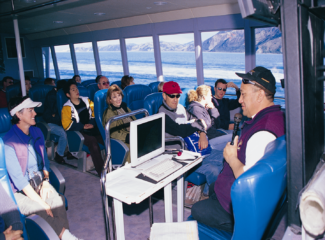 A guide shares educational information during a whale watching cruise in Kaikoura, New Zealand. Photo courtesy of Whale Watch Kaikoura. Include elements of local culture and heritage in tours: Visitors from afar are usually keen to learn as much about the local culture and heritage as possible. Tourism businesses that find ways to incorporate these factors into their products may be more competitive with visitors and generate positive feedback. This can include hiring local/indigenous guides or boat drivers (for example, ex-fishermen or even whalers) who know the area well and can share stories (perhaps in translation through the guide) of the sea and their own or their ancestors’ experiences and beliefs about whales and dolphins or other marine wildlife. Operators may also consider selling local art or handicrafts in their booking offices or on board their tours. Seek out training and capacity building opportunities: Many high quality whale watching certification schemes, such as WhaleSense and the ACCOBAMS High Quality Whale Watching label (see above) include training opportunities for whale watching tour operators and their naturalist guides. If these endorsed schemes are not available in a particular area, operators can consider collaborating to share the costs of inviting a renowned external expert to conduct training on one or several aspects of offering a quality experience, such as training for naturalist guides; boat-handling around whales and dolphins; customer care; or marketing and business management. Follow a business plan, and review and revise that plan regularly as necessary: While there are many components to offering a quality experience to customers, a successful business has to make a profit, and sound business management needs to accompany all of the elements above to keep a company profitable. For various reasons, it is common in many whale watching locations around the world for foreign-owned businesses to gain a foothold and a larger market share than locally owned and run businesses. Many local governments and managers would like to see more locally owned businesses succeeding and ensuring that profits from whale watching contribute to the local economy. Locally owned businesses may need to work harder to raise the funds needed to start a business, and to understand and meet international tourists’ expectations. Once established, however, they have the opportunity to set themselves apart as true local stewards of wildlife, with local insight, culture and heritage that can all contribute to visitors’ experiences. These strengths can be incorporated into a business’s mission statement and goals, and highlighted in the products they offer. Although meeting all of the above objectives may sound like a tall order, there are several operators around the world who have learned through experience that this can lead to commercial, environmental, and social success13, and the downloadable resources section of this handbook provides links to resources that can help operators achieve these goals. 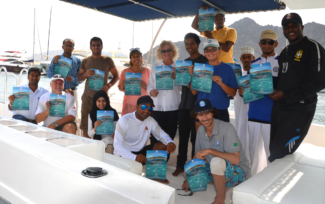 Boat captains and tour operators pose with their certificates following a responsible dolphin watching workshop in Muscat, Oman. Photo courtesy of the Environment Society of Oman. Image showing aspect of local heritage? Avila-Foucat, V.S., et al., The impact of vessel crowding on the probability of tourists returning to whale watching in Banderas Bay, Mexico. Ocean & Coastal Management, 2013. 78(Supplement C): p. 12-17. Luksenburg, J.A. and E.C.M. Parsons, Attitudes towards marine mammal conservation issues before the introduction of whale-watching: a case study in Aruba (southern Caribbean). Aquatic Conservation: Marine and Freshwater Ecosystems, 2014. 24(1): p. 135-146. Stamation, K.A., et al., Educational and conservation value of whale watching. Tourism in Marine Environments, 2007. 4(1): p. 41-55. Chion, C., et al., Insights from agent-based modelling to simulate whale-watching tours: Influence of captains’ strategy on whale exposure and excursion content, in Whale-watching: Sustainable Tourism and Ecological Management, J.E.S. Higham, L. Beijder, and R. Williams, Editors. 2014, Cambridge University Press: New York. p. 293-306. Currie, J., et al., Modeling whale-vessel encounters: the role of speed in mitigating collisions with humpback whales (Megaptera novaeangliae). Journal of Cetacean Research and Management, 2017. 17: p. 57-63. Filby, N.E., K.A. Stockin, and C. Scarpaci, Long-term responses of Burrunan dolphins (Tursiops australis) to swim-with dolphin tourism in Port Phillip Bay, Victoria, Australia: A population at risk. Global Ecology and Conservation, 2014. 2: p. 62-71. Andersen, M.S. and M.L. Miller, Onboard Marine Environmental Education: Whale Watching in the San Juan Islands, Washington. Tourism in Marine Environments, 2006. 2(2): p. 111-118. Lück, M., Education on marine mammal tours as agent for conservation - but do tourists want to be educated? Ocean and Coastal Management, 2003. 46((9/10)): p. 943-956. Lopez, G. and H.C. Pearson, Can Whale Watching Be a Conduit for Spreading Educational and Conservation Messages? A Case Study in Juneau, Alaska. Tourism in Marine Environments, 2017. 12(2): p. 95-104. Zeppel, H. and S. Muloin, Conservation Benefits of Interpretation on Marine Wildlife Tours. Human Dimensions of Wildlife, 2008. 13(4): p. 280-294. Zeppel, H. and S. Muloin, Green messengers or nature's spectacle, in Whale-watching: Sustainable tourism and ecological management, J. Higham, L. Bejder, and R. Williams, Editors. 2014, Cambridge University Press: Cambridge, United Kingdom. p. 110-127. Jacobs, M.H. and M. Harms, Influence of interpretation on conservation intentions of whale tourists. Tourism Management, 2014. 42(Supplement C): p. 123-131. Forestell, P. and G. Kaufman, Speaking from experience: Whale and dolphin watching boats as venues for marine conservation education, in Proceedings of the 5th International Coastal and Marine Tourism Congress: Balancing Marine Tourism, Development and Sustainability., M. Lück, Editor. 2007: Auckland, NZ. p. 63-67.